Professional hair brush made for hair care and salon professionals. P. Jentschura hairbrush have a very fine and irregular structure. This enables the brush to grip the hair well and clean it smoothly and gently. “100 brush strokes a day” are the best care for our skin and hair. The high-quality Professional Hair Brush from P. Jentschura gives you a natural shine to your hair and prevent your hair from dry, brittle tips. The natural bristles additionally stimulate the blood circulation and thus promote the important cleaning and recovery of hair soil with its hundreds of thousands of sweat and sebaceous glands. Hair growth is stimulated and the sebum in the scalp will be very gently distributed in the hair – the simplest and most natural hair care. The Professional Hair Brush P. Jentschura boar bristles are “shifted” used. So the brush size S can specifically be used for shorter or finer (more) hair but also for sensitive scalps which makes it a pleasant daily hair- and scalp-care and can become a small wellness moment. The extra long (XL), strong boar bristles of The Professional Hair Brush access especially if you have long and strong hair and enable an effective treatment of the scalp. The curved shape of the wooden body and 8-row bristle Bristling create a huge contact area on the scalp, so blood circulation can be effectively promoted. P. Jentschura brushes are manufactured in a German factory which has been producing high quality brushes for more than 165 years. 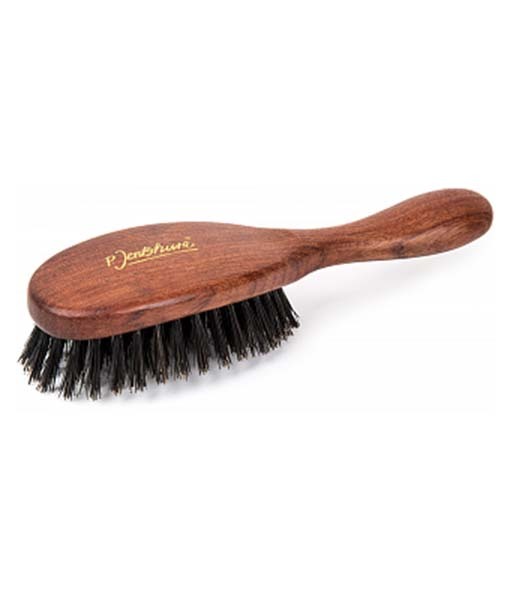 The body of the brush is made from solid Bubinga wood. P. Jentschura brushes are made with natural bristles. The best bristle quality is that of the traditional brand Chungking Tiger, which is used in P. Jentschura brushes.